The Sluggite Zone • Domain of Dreams: Land of Stone and Rumors. Post subject: Domain of Dreams: Land of Stone and Rumors. The party materializes in front of a gate similar to the one at the end of the tutorial zone. This one is larger, though, and positioned at the front of a city square. The city, on closer inspection, is as expected, a stone focused zone, with streets running along the side of the mountain's ridge. Some of them are carved from single stones, but there are traditional wooden houses as well. Other figures are roaming around. About a dozen or so are within the square, with others off along the streets. There is also some clear hot spots, such as a wide board that several players are crowded around, and several non human figures. Clearly NPCs, they are short and stocky. Some maintain shops, some roam in random patterns. And more than one is acting unusual, with an unusual symbol, like a burst, over their heads. "More noobs, huh?" A voice behind them says. Turning to look, the players see a person leaning against the wall, just a few feet away. He is dressed in dull blue tones, but only in cloth, with no armor. The tunic has a shoulder strap attached to a pouch at his side, and a hood hanging from the back He is also wearing fingerless gloves with wrist bracers. He is thin in stature, and has short hair and a thin beard both a dark midnight blue. What the party also notices is that his cursor, rather than the green of the others so far, is a blue color, as are the other players visible. The cursor's name reads "Rollen" and below that "Level 3". He lets out a whistle. "Huh. Level 2? So you actually cleared that glitch instance? Talk about double lucky. Did it get stuck in a tree's collision?" "No, we actually managed to take it down." replies Clarence. "The lady with the swords convinced me that I don't want to make her angry. However, we are, as you pointed out, noobs; none of us knew that the axe would vanish if no-one claimed it, so we were still discussing the matter of who should take it when it went." "Given your greater experience with the game, would you mind terribly if I asked you a question or two?" Karie narrows her eyes at the newcomer into a glare. Who's this d-bag? 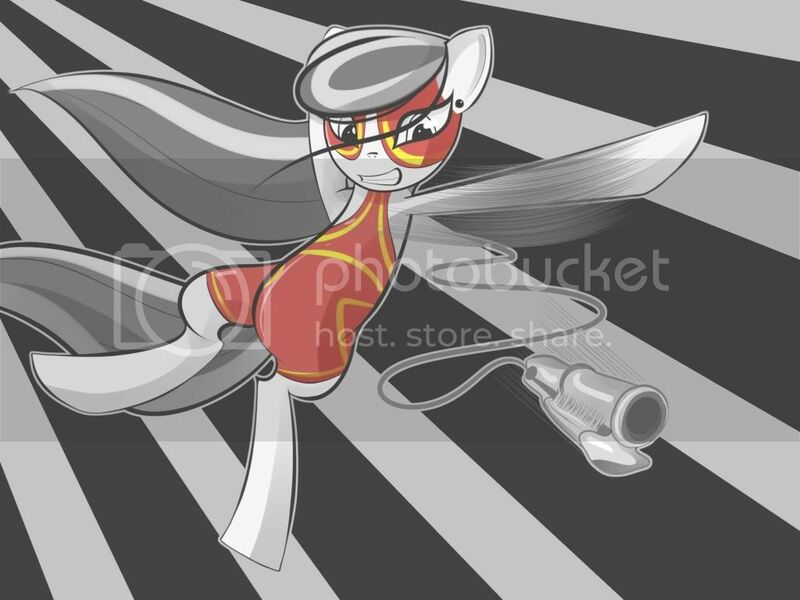 With a stomp forward, she lifts her fist and says "Call me a noob again, and I'll clean your clock. I've top-three'd more times than there are skyscrapers in the Loop. "That bear was child's play." She turns and casts her sickening smile at Brand and Teiresias, though she refuses to grant Kai the same courtesy. Turning back to Rollen, she says, "So, what's yer business? Someone who's only level 3 ain't got the right to judge." "Hey now, hey now, don't be rude Karie." Kai slips between Karie and the new comer named Rollen, "Forgive her, Karie's a bit of a grumpy cat. I died to that big woody Bear while my team-mates took it down! I'm a good meat-tank. Did you get a glitch too? Have these thing been happening much?" Maya, meantime, is looking around both physically and via menus for the next game quest. It's not absolutely certain she even so much as heard Rollen. The guy's eyebrows arch at Clarence's commets. "Hoo hoo, really? Don't think I've heard that one before! Everyone just says that level one gear just doesn't do enough damage to the thing's hide! But I don't know, matchstick. I've only been playing 2 Real Time days so far. Eh, well, I'm waiting for my buds to get on, so it might be your lucky day after all. What do you want to know?" Karie stomping over and snapping, with Kai right there to try to intercede, seem to take him aback a bit. But then, he laughs a bit. "Kuuu....HAH! You're alright, kids. You don't need to downplay it though, that glitch is causing a lot of new characters trouble. The boards are full of griping, saying that the frequent patches keep trying to fix it, but that damn bear pops up at least 10 percent of the time. Its a boss from a Level 2 to 3 elf quest, after all. He rolls his eyes, and sighs. "Most of the time, the party gets bumped entirely, and the DMs gotta jump in and manually transfer you to the starting cities. What an unlucky pain. Gotta say, missy," he looks at Karie. "You're quite the firebrand. Not surprised you and your bud here managed to take that thing out. Act--hmmmmmm... Karie...Kai..." He mutters, looking at their name labels. "Somehow that sounds familiar, those two names. You two work together in other games, maybe?" "We've been in tournaments together! Karie's my rival!" Kai seems very pleased with this. "What are the pitfalls?" asks Clarence. "Those silly mistakes that all - or most - noobs make and then learn from withing the first day or two. I think that's the most important thing to ask about." "Huh, wait, you mean the bear was actually a glitch? I wondered at first, but I thought it was just the developers throwing in some sort of foreshadowing at a secret background which is going to be revealed later. Man, I was about to compliment them on spicing up the tutorial." Brand then turns to Karie, and smiles gently. "Calm down, Karie. Some of us are noobs. I've never played an MMO before, although I still took down Enki in SMT:X, so don't underestimate me too badly"
Teiresias grows quiet as he observes the new surroundings, taking in what details he can. Idly, he slings his hammer across his shoulder, and lets loose a low whistle at the appearance of their new surroundings. The setting isn't terribly beautiful, but the change was interesting enough. As Karie confronts the player character that had appeared before the group, Teiresias sighs, half-heartedly returning the smile she gives to both himself and Brand. "The gear doesn't have to be good enough, we're just smarter than the average bear." Teiresias says with a small chuckle at his lame joke from an era gone by. A glitch, eh? Something I'll have to be wary of then. Make serious note of that. "I'll admit, I'm no noob to MMO's, but this is a different experience than I'm used to. I feel like I'm learning so much, and getting far more distracted than usual. I'm trying to figure most of this out on my own. Plus some character things." Teiresias nods, drifting off in thought once more. "I suppose my only question is where the next quest might be." Karie is about to give Rollen a piece of her mind when Kai chirps out three simple words. Her face begins to turn red as she turns and gives a vexed scowl at Kai before turning on her heel and storming to a place where she can sit and vent, completely ignoring the others. Kai blinks, "Did I say something wrong? I mean I have fought her in countless tournaments..."
Rollen shrugs off the reaction of the odd two. "Never was much for the tourney scene, though I used to catch some of the old matches when they used to stream them. Is that a glitch, though? Her face is turning remarkably purple." Maya, wandering around, finds herself in front of the board with other players. A few are looking carefully at the board, which, when focused on, has a couple options appearing in midair to select. "Bounty", "Collection", and "Skill". "Next quest? Well, the beauty of this part is that you got some options. Lucky you, you got a head start on power, so you can probably handle any of the opening options. The story quests for this race's zone are helping the dwarves deal with an incursion of monsters. There are two nest clearing missions, one of spider monsters and one with cave dwellers. The second one's a bit harder, but its got better gear. Alternately, youre just in time for the RL Daily raid. 5:08 Real Time, (the clock on the readout says 5:06) they take 3-5 parties for a war scenario. Rumor has it that although its against monster sets for now, they're prepping for PVP questing with the other opening zones. Elves, Dwarves, Sprites, and Gobins are the 4 starting zones. Well, that's just a guess." He turns to Clarence, and snickers. "Pitfalls? Well, I don't know, my first IG(in game) day I wasted hours because the creatures look so real I froze up. Otherwise, watch your back, don't let the creatures pick you off individually, and don't trust anything that squirrel says. Don't ask." "Oooh! A Raid! Guys let's do the Raid, I bet it drops really good Gear, something better than that Axe! Oh speaking of..." Kai brings up One's upgrade menu and checks to see if there are any upgrades available for the crystals Kai has. Rollen shakes his head. "Well, I won't argue with you, and you might be fun to have along, but don't come unless you can pull your weight, the last thing you want is to get a b ad reputation." "Like you, you mean?" Without noticing, a hand had appeared and smacked Rollen in the back of the head. There is a impact, a flash of light, and a brief system warning on the barrier at the contact. He turns and grins. "Oh come on, Lep, I'm just giving these first timers some tips. What's wrong with that?" The tall woman in reddish half plate shakes her head. "The problem is that while you chatter away, the others and I have been out working on the next task. I don't care WHAT you say about your role, I want you to start puling your weight!" Rollen motions to the party. "Well, I should at least introduce you. This is Leply, she fancies herself the leader of the team I work with, Flare Sun." Most striking about the woman is her hair. It has been cut to her skull, leaving only a fine buzzed coating, in a yellowish color. She also carries a long, thin sword, an oversized rapier. "Sorry, kids, but this dope will just go on and on if you let him. So, did I hear you say you were interested in the war Sequence?"